Partnership: It was a word said over and over again on an evening in the Fremont neighborhood of Seattle as the Clean Water for the Center of the Universe team gathered to celebrate achievements and look to the next phase of this project. Mark Grey, the developer who is the charismatic face of this project, pointed to each of the partners in the room that made this project a reality: Salmon-Safe, The Nature Conservancy, KPFF, Weber Thompson, The Boeing Co. and many others. Each of these entities collaborated, bringing their strengths and their funding to enable green-infrastructure features that will filter close to 600,000 gallons of polluted runoff running off the Aurora Bridge. 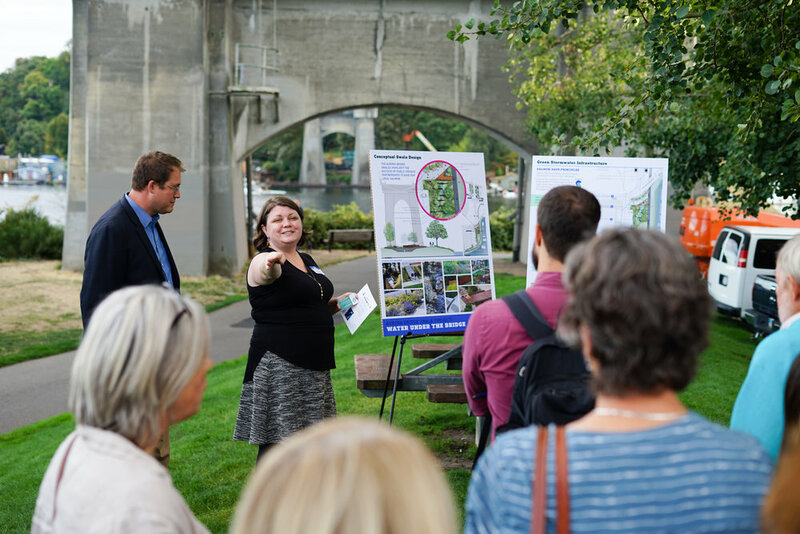 Now, with the completed bioswales on Troll Ave North and North 34th Street as a backdrop to this event, the team launched into the third phase: bioswales designed to capture 1.2 million gallons of stormwater annually from the Aurora Bridge! These bioswales will have a positive impact on the water quality in the Lake Washington Ship Canal, a critical migration route for salmon species Chinook, coho, sockeye and steelhead. The conceptual design for these bioswales revealed by Weber Thompson and KPFF sets the stage for the next steps: construction documents, permitting and additional funding. While the team is excited to install this bioswale and start capturing the polluted stormwater from the bridge, they are also looking at the long-game: more green infrastructure under bridges! Transportation corridors like the Aurora Bridge continually stand out as high sources of stormwater pollution on the Stormwater Heatmap. “Phase three is about creating a blueprint for future public-private partnership for addressing stormwater under bridges,” says Grey. Beyond the size, this is the distinct feature of the third phase — it is focused on creating a pathway for other developers to partner with public agencies to install green infrastructure that filters polluted stormwater. Though no public funding is yet committed to the project, there is an effort to engage public agencies such as state Department of Transportation and Seattle Public Utilities to dedicate funding to reducing polluted runoff coming off bridges.